The Grandmasters, another story about Ip Man (there are a lot now) Gets A Trailer For the Release in the US. The Grandmasters was picked up by The Weinstein company for the release in the North East and the trailer has just been released but it’s getting some flack around the web world. I Never seen the film so I can’t Judge it 100% . The trailer does portray the movie to be action packed even though it’s just one fight scene the flack would mostly go after the voice over which makes it seem the film is all action. Full of action or not I’m still going to get this but I can see that The Weinstein company is trying to reach an audience who isn’t to fond of Martial art films like back in the day when distributors released Shaw brother films with different titles like adding death to try to catch the eye of …you and me. I have to say I have no problems with this as long the film is good the trailer shouldn’t upset the new view after watching the full film. All in all I am trying to do the same with this site, as in trying to get the non martial art film viewers to enjoy what they are missing by including news of all films mixed with news of Asian films released in the US. 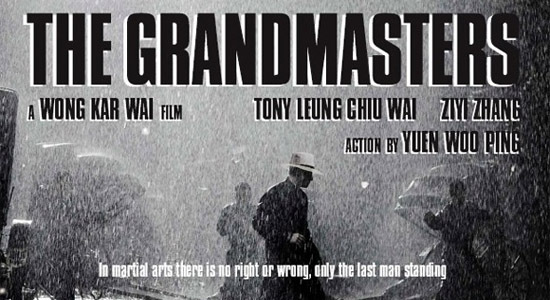 Plot: THE GRANDMASTER is an epic action feature inspired by the life and times of the legendary kung fu master, Ip Man. The story spans the tumultuous Republican era that followed the fall of China’s last dynasty, a time of chaos, division and war that was also the golden age of Chinese martial arts. Filmed in a range of stunning locations that include the snow-swept landscapes of Northeast China and the subtropical South, THE GRANDMASTER features virtuoso performances by some of the greatest stars of contemporary Asian cinema, including Tony Leung and Ziyi Zhang.